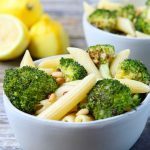 Lemon Penne with Oven Roasted Broccoli is a pasta recipe that is super simple to make. It is bursting with fresh lemon flavor and lightly caramelized oven roasted broccoli. It is sure to become one of your favorite go-to dinners. This recipe is a highly requested dinner at my house. My husband and I have been eating it for years. It started as a recipe from Ina Garten called Bow Ties & Broccoli. However, thru the years, I have morphed the recipe by removing this.. adding that… changing this… and it has now turned into my Lemon Penne with Oven Roasted Broccoli. It is a dinner recipe that I love because it is so simple to make. All the steps can be done simultaneously, cutting down on your time in the kitchen. 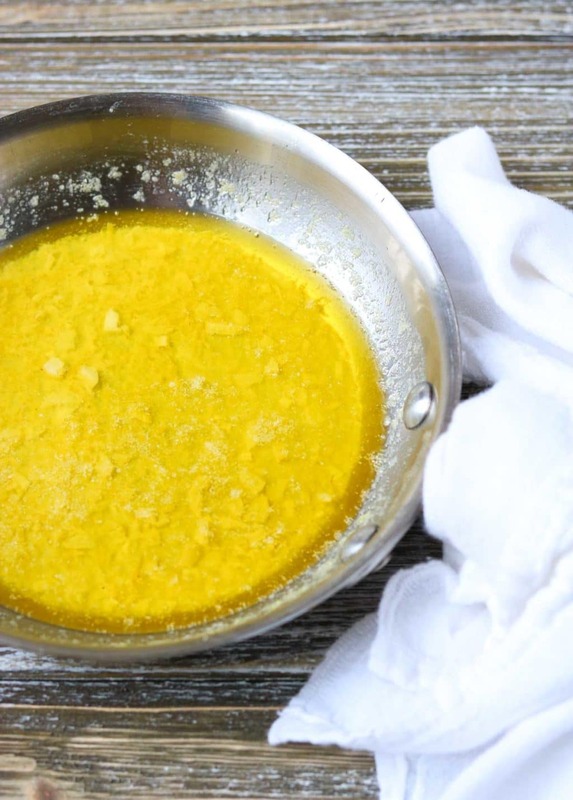 While the pasta boils and the broccoli roasts in the oven, you can be making the lemon butter sauce! Once you have the recipe down you can truly have this completed and on the table in 20 minutes. Cooked, really boiled, until it almost melts in your mouth, with lots of butter, of course! Oven roasted to a perfect al dente with lightly caramelized edges. For this recipe I prefer to oven roast my broccoli at 400 degrees for about 12 minutes. This leaves the broccoli nice and al dente so it still has a little bite. I think that texture holds up nicely next to the pasta. Now if you like your roasted broccoli just a little more caramelized then you can either bump up the temp. to 425 and stick with the 12 minutes, or keep it at 400 and roast it a little longer, between 15-18 minutes. Just keep an eye on it to make sure your broccoli doesn’t burn! How good does that sound, Lemon Garlic Butter Sauce! My mouth waters just from typing it. This sauce is where the flavor is at in this recipe. It is a buttery sauce with a burst of fresh lemon and a kick of garlic. Those flavors compliment the roasted broccoli perfectly! In a sauce pan you melt the butter and olive oil together. Add the lemon zest and garlic and let it lightly simmer for a few minutes. Off the heat you add the fresh lemon juice and a little salt. That is it. I know my kids can be picky about the type of pasta I use (which is crazy because they all taste the same for God’s sake!). Try using spirals, macaroni, or bow ties. Add some fresh grated Parmesan cheese over the top for an extra layer of flavor. If you want to add some more veggies you could try throwing some cherry tomatoes, and zucchini on the sheet pan with the broccoli for the last 5 minutes of cooking time. This would make a nice pasta primavera! In the spring when asparagus is in season and inexpensive try subbing it for the broccoli. Substitute chopped walnuts for the pine nuts. Just make sure to still roast them in the oven with the broccoli. This will bring out their natural buttery flavor. If you have a spiralizer, try this recipe using zoodles (zucchini noodles) instead of pasta. To be totally honest, when we have this for dinner during the week I usually do not make an additional side dish. However, you could add my Marinated Grilled Chicken, and some garlic bread to make this a wonderful weekend dinner or entertaining dinner. If you are looking for a great dessert to pair with this dinner, my Summer Berry Cobbler is the perfect pick! If you made this recipe let me know how it turned out for you by commenting below, rating the recipe, or sharing it on social media! 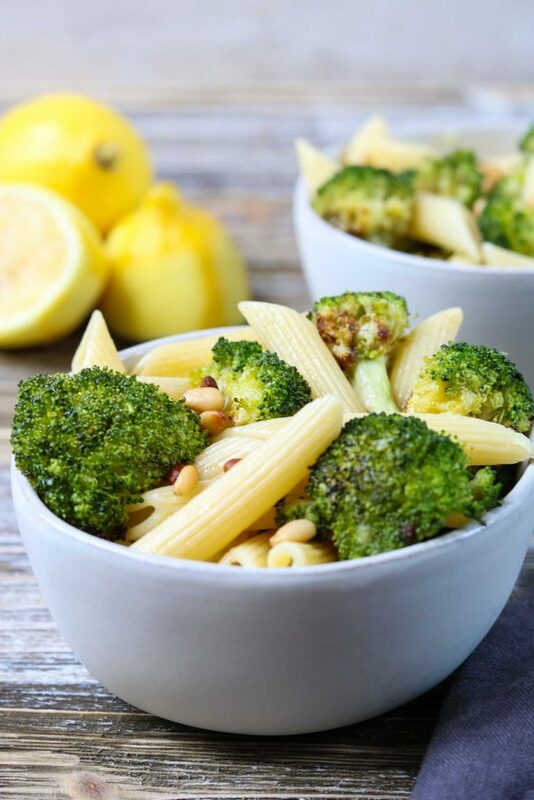 I hope you give this recipe for Lemon Penne with Oven Roasted Broccoli a try in your kitchen. 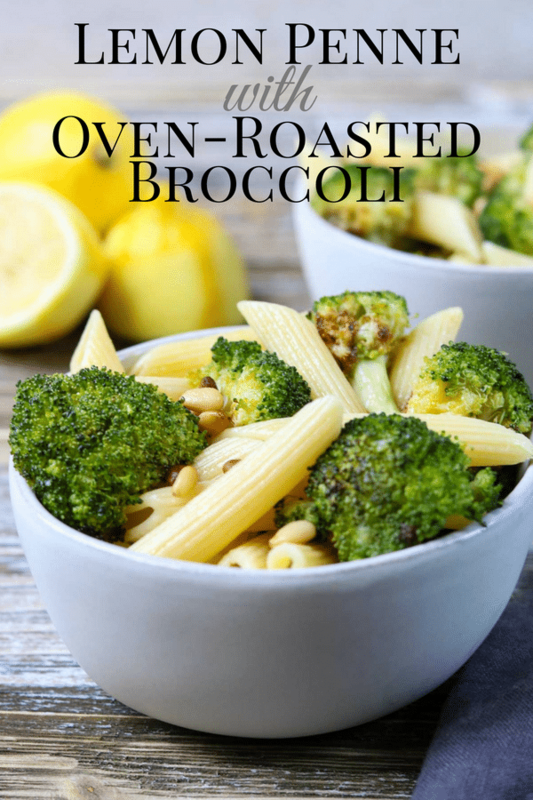 A super simple pasta recipe that is bursting w/ flavors of fresh lemon, warm garlic, & caramelized oven roasted broccoli. A great dinner recipe for tonight! Cook the penne pasta according to package instructions. 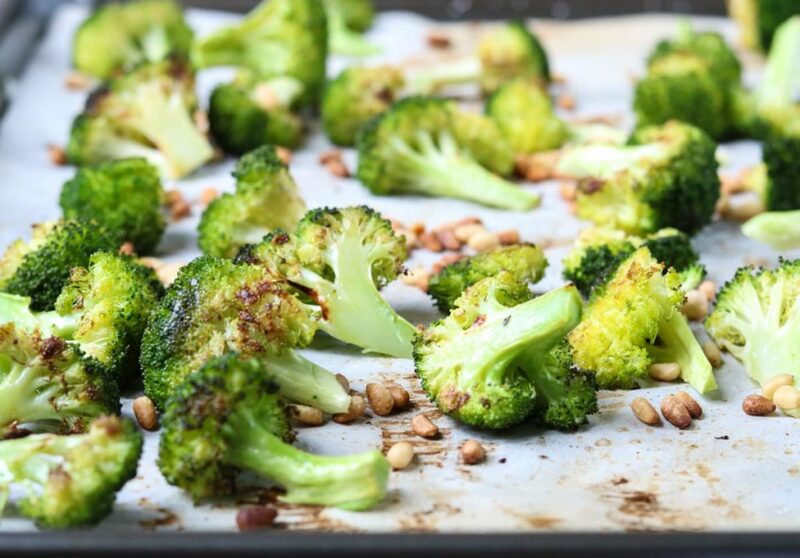 Place the broccoli florets on a sheet pan lined with foil or parchment paper. Drizzle with a generous glug of olive oil and sprinkle with a little salt. Add the pine nuts to the baking sheet (with the broccoli) and roast and additional 1 1/2 - 2 minutes. In a small sauce pan add the butter and olive oil over low heat. Once the butter is melted add the garlic and lemon zest. Cook for 2-3 minutes, making sure the garlic does not brown! Off the heat add the lemon juice and salt. 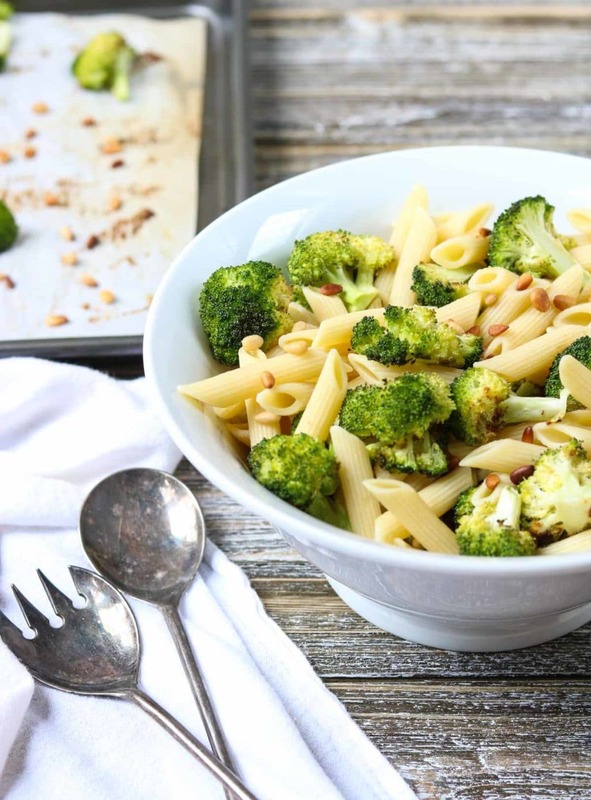 In a large bowl combine the pasta, pine nuts, and broccoli. Drizzle the lemon garlic butter sauce over the pasta mixture and toss to coat. I think roasting broccoli in the oven is the best way to make broccoli. Love the addition of the pine nuts too – and a lemon garlic butter is great with anything! Love everything about this! So easy and the flavors are incredible! I love all things lemon and pasta is no exception! This looks to die for! Thank you, Nicole!!! I love lemon too! Literally every ingredient in this recipe is a favorite of mine! 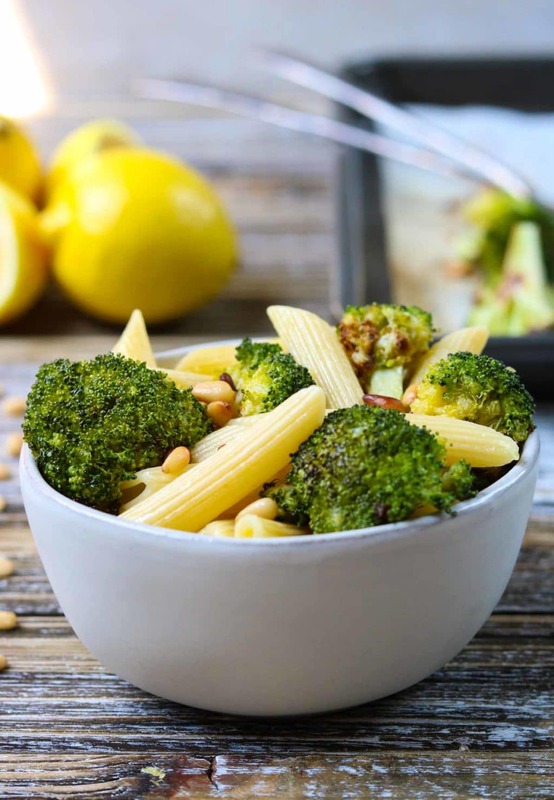 I love lemon with broccoli and the crunch of pine nuts – delicious! Oh Good!!!! I hope you love it! This sounds really good, Susie. I can see it as a side dish or a main dish both. Thanks! Thank you, Bill! It can definitely be used either way, it would be great with a grilled chicken breast.